Russia has bought a massive 300,000 troy ounces of gold bringing Russia's gold reserves to 1,891 tonnes as the country prepares to protect themselves from the coming devaluation of the US dollar. 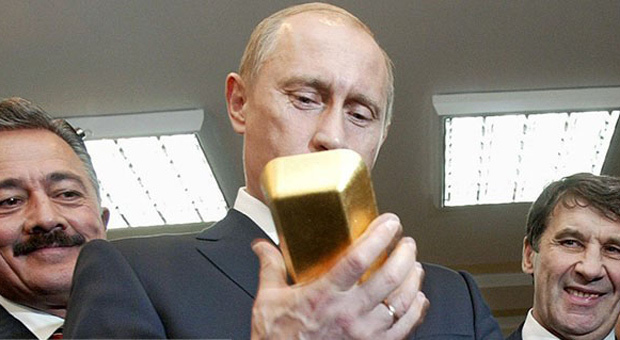 Russian media has reported that continuing diversification into gold bullion by the Russian central bank. It now suggests that gold is being used as a bulwark to protect Russia from the stealth financial. trade and currency wars which appear to be getting worse. In the last 18 years, Russia has managed to increase its economy by PPP by 600%. 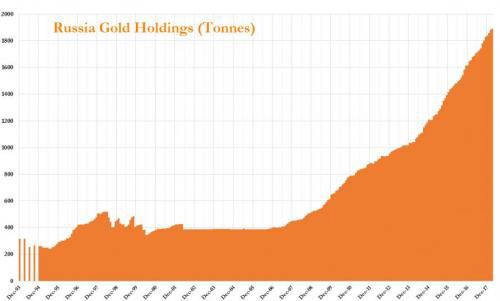 Zerohedge reports: Russia is not the only country diversifying into gold and many other countries are doing so as they seek to protect themselves from the coming devaluation of the US dollar and U.S. dollar hegemony. This is evidenced both by gold purchases and also in many strategic decisions regarding the storage of national gold reserves. While Russia was adding to its gold reserves, taking it above China's holdings, Russia's new ally Turkey was busy removing all gold bullion reserves held in the United States. Both are clear moves against US dollar hegemony. Gold reserve changes combined with the news that Russia and China have agreed to settle some trades in ruble and yuan is a clear step that the world's super powers are looking to reduce dependence on the US dollar and the increasing move away from the US dollar as global reserve currency. Putin has long been on a mission to build up the country's gold reserves after previous Russian governments ran the country's reserves down to less than 300 tonnes. The current president has made it clear that the country should be holding gold, rather than US dollars. For many years, the Russian central bank has consistently bought gold, driven by Putin's believe in the financial sovereignty offered by gold and its protection against geopolitical and economic risks. “Under the instruction by President Putin, the Bank of Russia has been implementing the program of increasing the absolute share of gold in the gold and currency reserves of Russia for many years." Putin first came to power in 2000 and since then the country has had more months than not, when it has purchased gold bullion. 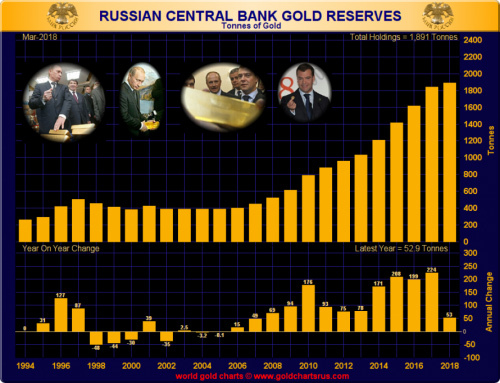 A large jump in reserves was seen in 2014 after Western sanctions were imposed and Russia has been the world's largest gold buyer ever since. It is now the fifth largest gold holder after the United States, Germany, Italy, and France. Russia is also the third largest producer of the precious metal. As a result, the majority of its purchases are locally sourced, giving the country an additional edge when it comes to protecting its finances. This is something that China is also wise to. It does not allow the export of any gold mined in the country, further evidence of the desire to protect the country's financial system and economy and position the yuan as an alternative to the dollar in the long term. 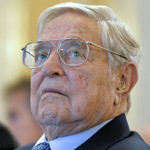 Many believe that should bad relations continue between the US and these nations then US-denominated assets currently held in forex holdings by the relevant central banks, could be dumped for alternatives. Nations may opt to diversify into the Chinese yuan (in the case of Russia) but also gold. Most likely it would just take either Russia or China to do this, before many others followed suit. When loans are made in dollars, the debtor is instantly taken hostage by the issuing central banks' policies. The central bank determines the price of dollar through monetary policy and it's value thanks to currency printing. Were loans to be issued in gold these huge counter party pressures would no longer be a feature of the largely dollar based debt-system. The news broke last month that Erdogan's central bank had decided to call back its gold reserves held in the United States. There were reportedly 220 tonnes stored in the country. 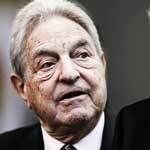 The decision followed Erdogan's call to "to get rid of exchange rate's pressure and to use gold against the dollar." Speaking to RT about Turkey’s decision to repatriate its gold from the US Federal Reserve, Anatoly Aksakov (chairman of the State Duma Committee on Financial Markets) said: "We do not have a gold reserve in the US, we have only Forex (foreign exchange) reserves abroad. No one can lay hands on our gold." 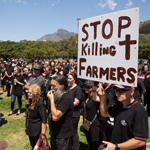 By removing gold from one jurisdiction to another you are making one very loud and political statement - we can look after our gold and we don't want you anywhere near it. 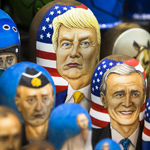 Whether through sanctions or trade tariffs countries are beginning to really feel the weight of the US and its allies' powers. As a result, they are using gold to protect themselves and to protect their foreign exchange reserves and hard earned national savings. Investors can learn something here. Fiat currencies will always have a counterparty that is far more powerful than the saver or pension holder. There is rarely little interest by the fiat issuer to take note of how it's currency management is affecting the individual's savings and investments. Investors should follow suit and act as their own central bank. Prepare financially by having a sensible allocation to physical gold so that it is protected from central banks massive monetary experiment that risks destroying all hard earned wealth. Gold also serves to protect in times of heightened geopolitical risk, terrorism and war. Follow the same steps as these aforementioned countries - own physical gold, store in a safe jurisdiction and ensure you have legal title to your bullion through allocated and segregated bullion ownership.